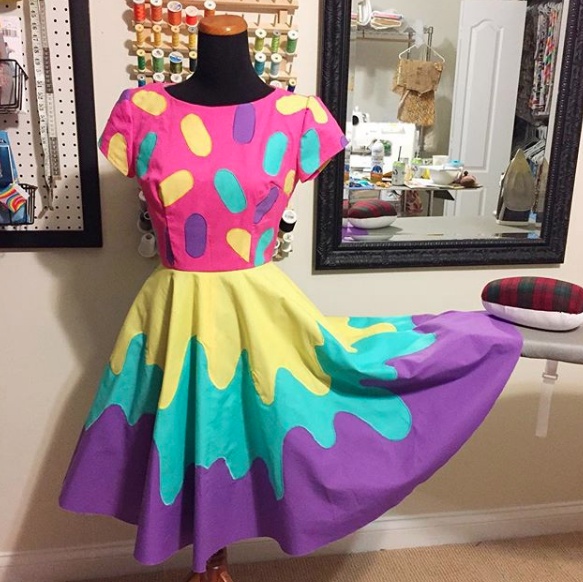 My goal this summer was to stitch up one dress a week. After sewing this beast a couple of weeks ago...I've since changed my lifetime achievement goals. BECAUSE THIS DRESS WAS A MOTHER-LOVIN' BEAST. Now look, don't get me wrong. 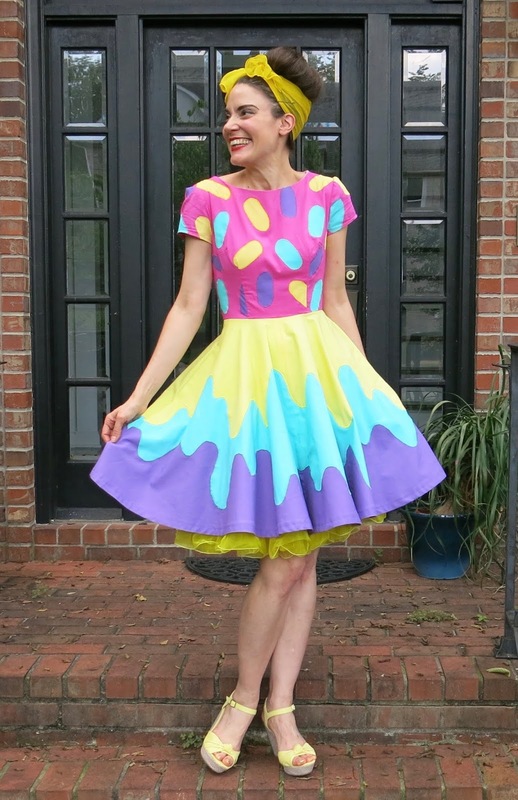 I LOVE this dress and wanna wear it every day and make about a million more in a variety of colors. But.You.All. I cherish the sliver of sanity I like to think I have left. And therefore I will not be making another dress like this for a while. It's gonna be like the Halley's Comet of Dresses that only makes an appearance every 75 years. 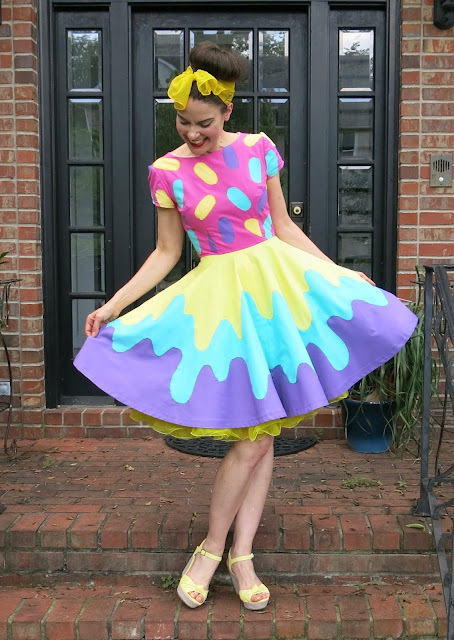 And, like, I'm kinda thrilled that my dress actually kinda-sorta looks like my drawing. That NEVER happens! Mostly because my drawing looks bananas but also because I can't sew and 99.9% of the time, I'm just winging it. I decided to go with a 1950's pattern bodice and my trusty Anna Maria Horner circle skirt pattern. 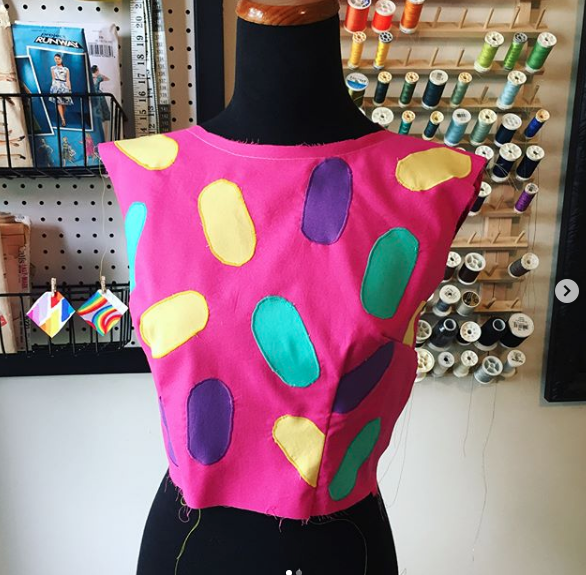 Now the 50's pattern did lead me astray as it had me install these horrible, puffy-topped, too-long sleeves that had me lookin' VERY 1980's Working Girl. I mean, I had shoulders for DAYS. I promptly ripped them out and went with a cap sleeve. But the sleeves were the least of my worries. It was THE APPLIQUE. What in the world was I thinking?! I cut out and appliqued no fewer than 29 sprinkles. I think that was how many there were. I dunno. TOO DANG MANY, THAT'S HOW MANY. I'm sorry for shouting but if you had to live thru this, YOU'D.SHOUT.TOO. Okay, I thought. Bodice done. 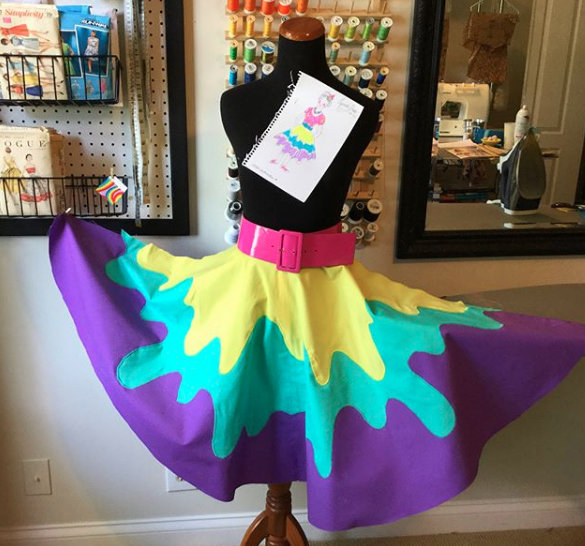 Surely the skirt will be easier as it's only too colors. AND no. A circle skirt is massive...and appliquing around that alone takes a bit. Add the squiggly line of melting ice cream and you have a project that takes FOR.EVE.RRR. Insert all the annoyed face emoji's here. Lady at the grocery: What are you supposed to be? Me (going all existential on her): I don't even know anymore. Lady at the grocery, shaking her head: No, I mean, are you in a costume? Literally, that's all I had. I was so tired from sewing, I couldn't even give her more than a NAW, LADY. THIS HERE IS MY ENSEMBLE. Now, move, I gotta go figure out what I'm supposed to be! 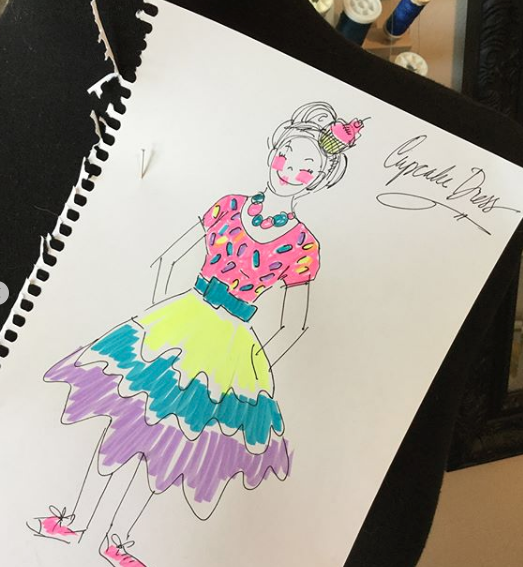 Now, I say all this because y'all know good and well I'm gonna have to applique me some more dresses...I have them all sketched out and ready to go. Wish me luck! Love it! 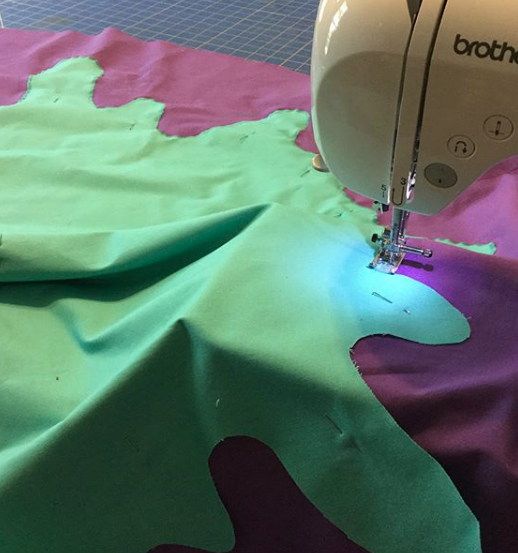 Have you ever tried a fusible web for applique? 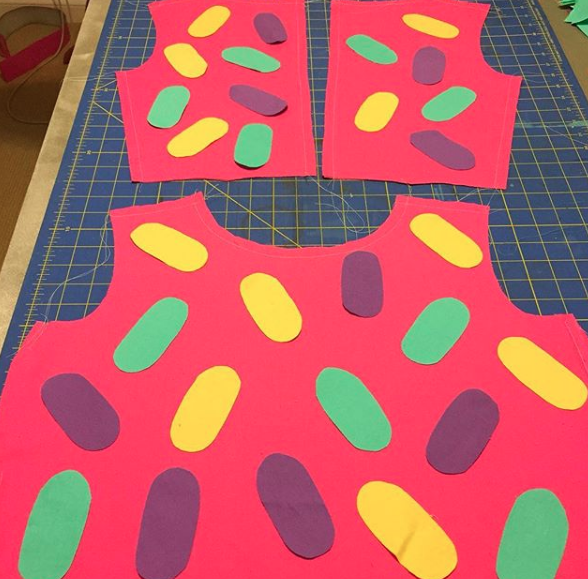 You could use a lightweight heat n bond or wonderunder to iron on the sprinkles and icing, then go around them once with a single layer stitch, multiple lines of stitches, or a zigzag stitch. Or, use a heavyweight fuse like Heat n Bond's heaviest product, and you wouldn't have to stitch them on at all. Cute dress. I can see this on younger girls too. You might share how you did the drips of ice cream. It has so many possibilities! Oh this is spectacular!! Can I ask, what type of fabric did you use? 100% cotton? Adorable. Just looking at it makes me smile. Congratulations and I hope you we are it OFTEN and with JOY. First Days of School ... The Art Room Edition! 22 Fun Projects to Rainbow-ize Your Art Room! 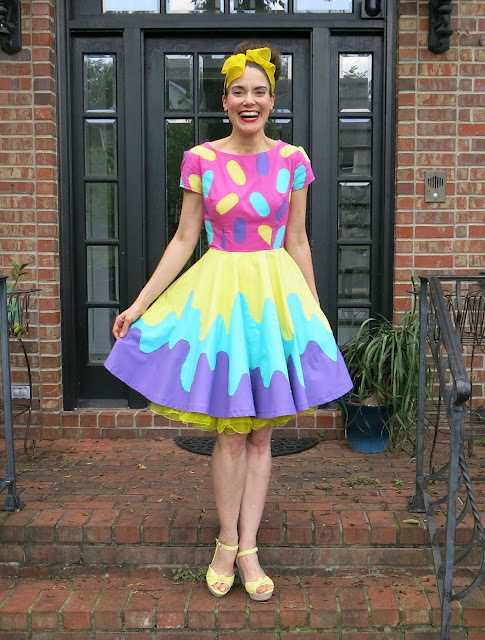 DIY: Round Towel to Circle Skirt...with Pockets! DIY: Beach Towel to Circle Skirt!